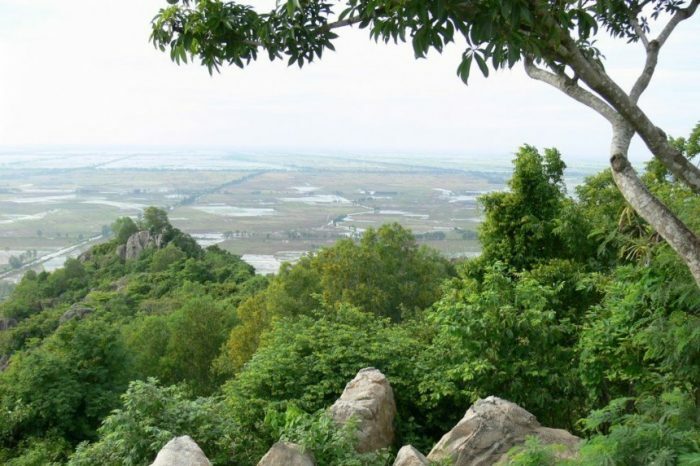 Forbidden Mountain is the highest and biggest mountain in the spectacular mountain range That Son, about 90km away from Long Xuyen City, along National Highway 91, passing through the provincial road 948. The magnificent Forbidden Mountain rises in the middle of the Cuu Long Delta, with an elevation of 710m from Bo Hong Peak. 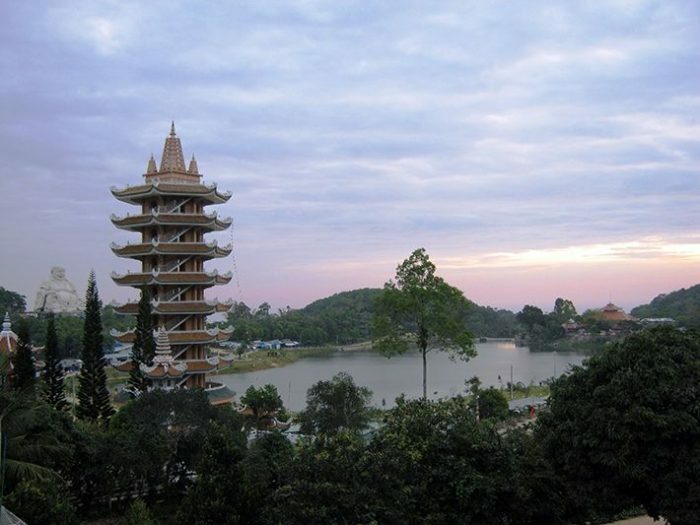 Looking down the Buddhist pagoda (An Binh Hamlet, An Hao Commune), visitors will see a large basin surrounded by rolling mountains of Thien Forbidden Mountain, including Dau Peak, Bo Hong Peak, Thien Tue Peak… With high altitude, Forbidden Mountain is like a Da Lat of the Mekong Delta. Because of the cool climate all year round, there are many attractive landscapes, myths, and lore. Why is this mountain called the Forbidden Mountain? There are two folks: First, Forbidden Mountain is very dangerous, so people do not dare to go there except the mysteriously metaphysical characters. People accidentally prohibited themselves to encroach on that area. 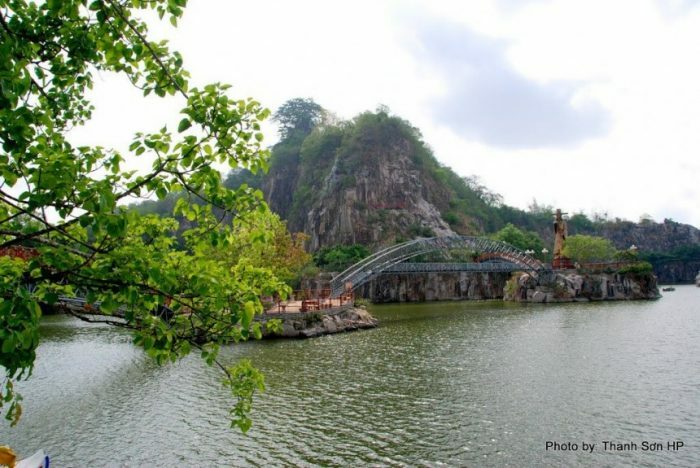 Second, it is legendary that besieged by the Tay Son troops, Nguyen Anh King had to run up to this mountain, then forbid people to go up the mountain and from that time on, the mountain is called Forbidden Mountain. 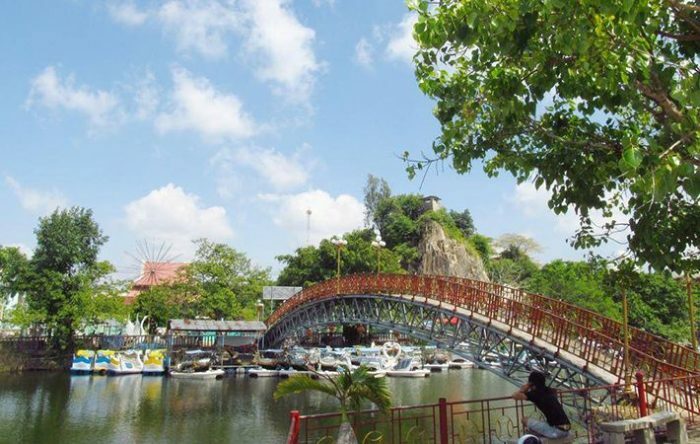 At the foot of the mountain to the east is Lam Vien sighseeing area – Forbidden Mountain, covers an area of about 100 hecta with various entertainment services and Kaolin restaurant serving specialties Bay Nui. There is a path up the mountain to a wide and romantic stream named Thanh Long and “Forbidden Mountain Plateau”; we turn right and go straight about 1 km to Thien Tue Peak, follow the ramp to Big Buddha Pagoda, you can visit Thuy Liem Cave and Bach Tuong Peak standing on the side of the mountain. Then you will approach Big Buddha Pagoda, Van Linh Pagoda, then Bo Hong peak – highest peak of Forbidden Mountain and in the Mekong Delta. Looking down, you can see Ha Tien Islands. Sap mountain is also called Thoai moutain, the largest mountain in Sap Cluster comprising four mountains: Sap mountain, Nho mountain, Ba mountain and Cau mountain, located in Thoai Son district, An Giang province. Moc mountain has an elevation of 85m with circumference of 3,800m, 29km far away from Long Xuyen city by provincial road 943. In the past, Sap mountain shaped rabbit sitting on the green rice field to the horizon. By the time, the mountain was deformed into colorful shapes, drawing on a mysterious mountain space. The western side of Sap mountain has the most spectacular view of Thoai Son Mountain: Lake No.1, Lake No.2, Ong Thoai Lake, which is connected by mountain tunnels and Sap Mountain Caves. These three lakes were created only a few years ago when Sap mountain was explored deep into the foothills to make attractive stone products. Here, you can sail to admire the majestic beauty of the high mountains, deep caves, deep blue lake with the flock of fish swimming. 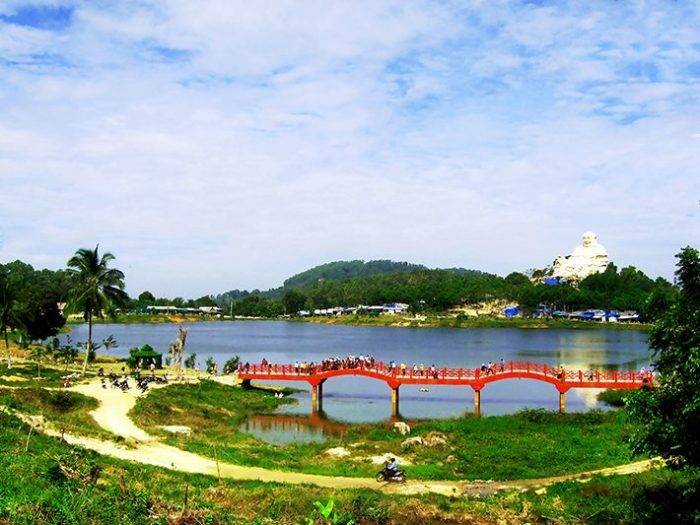 Around the lake, a number of small islands is engraved with goddess Siva, Ponagar tower, Linga, Yony … by the artisans in Ngu Hanh Son, Da Nang. A road system has also been opened up to the top, though not very high but still gives you the feeling of fresh air and from there, you can look over the whole town of Sap Moutain and the far-flung rice field full of white smoke. The harmonious combination of the wild nature with the majesty of the mountain has made Sap mountain not very high but beautiful and poetry. These are the golden yarns of the sky mixed with the purple of the forest and the blue of the trees mixed with the light blue of the lake at the bottom, making the scenery here more attractive to visitors. 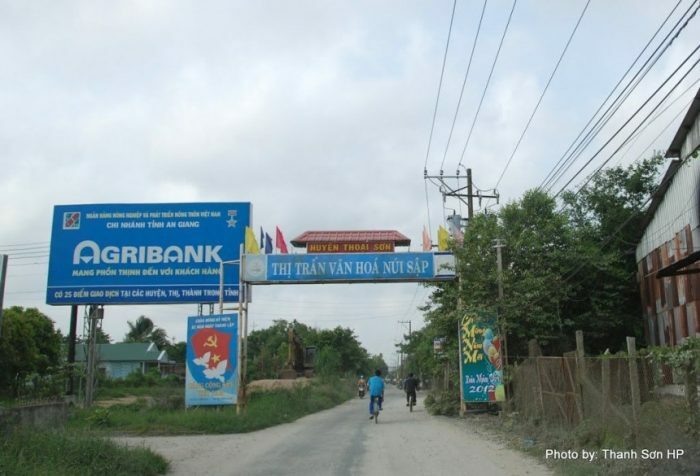 Sap mountain town is now the administrative center of Thoai Son district, An Giang province. If you have the opportunity, step out here to feel the green and gentle mountain. Sam mountain has an area of about 280 hecta, with a moderate height of 241m. 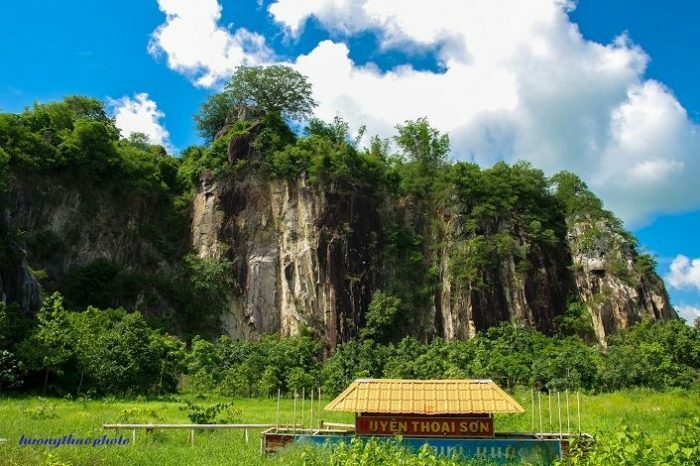 In the Nguyen Dynasty, Sam mountain is located in Vinh Te Commune, Tuy Bien District – today is Vinh Te Commune, Chau Doc Town, An Giang Province. This is the lonesome mountain range of South Vietnam. Standing on the highest peak of Da Dung Mountain (about 6km away), you will see a green field with a picture of a horseshoe crab. There are many legendary stories about horseshoe crabs that once lived there. This land is covered with trees all year round, blue sea on one side and green rice fields on the other side. You will sometimes approach Cambodian-style pagodas (Buddhist monks and nuns often wear gold costume and live by begging). The climate is cool because of the fields and canal system around. Separating from the influx of people to visit Sam Mountain during the festival, as told by a local people, I enameled down the east side of Sam mountain to find a few leaves of Aganonerion polymorphum. If you have ever tasted this leaf, you will feel surprised by the sour taste and a little bit of fat. Leaves are used to cook with chicken. Cham Islam is a religion of the Cham people in Ho Chi Minh City, Dong Nai, Tay Ninh, An Giang. Cham people in Vietnam belong to the Sunni mulism. Islamic followers have strict rules about the doctrine and canons of Islamic law. The journey of Northen people to the South Vietnam from the 11th to the 17th century have led to a large number of Cham people moving to Cambodia. In the mid-19th century, under the French rule in Indochina, many Cham Muslims migrated from Cambodia into the Mekong Delta, developing the Muslim community in Vietnam. The Muslims in South Vietnam are orthodox Islam, not blended with old customs and beliefs, connecting to Cambodian and Malaysian. Muslims in Malaysia have had a great influence on the Cham community through the Malay scriptures. Cham people often seek to study in Malaysia and cultivate the idea of Islam through the inference of Malay Muslims. In the South, in French colonial period, there was Saykhon Islam representing the Muslim community for Cham and Malay people. In 1960, under the Ngo Dinh Diem President, the Cham community established “Cham Association of Vietnam” with offices in Saigon, Vietnam Republic. In 1966, there was another organization, the “Council of all Vietnamese Mosques”, located in Chau Doc. Both organizations existed until 1975. Islamic mosques shape as familiar as those in the world. It respects the rules of architecture as well as the interior decoration. There are two types: the Mosque and the Surau. The church was built in the direction of East-West towards Mecca. Inside there is a place where Imam dignitaries are leading the ceremony, and Minbar is the place where Khotip teaches catechism. At the corner of the cathedral, there is a high tower for dignitaries to call the disciples to the ceremony. The cathedral is also known as the chapel where prayer and gatherings are held. There are 41 mosques in the country, and 19 mosques in Islam. The majority of Islamic kinsmen have relatives abroad, who themselves at least once repaired their spiritual duties in their lives as pilgrims visiting Mecca and becoming Hadji. The Sunni Muslims of today in the Sunni Islamic group have about 26,000 followers and 288 Islamic clerics. The characteristics of the Wallago attu are that they usually overtake the wetlands to “make love”, the males thrust the females in a fierce, violent way and they even climb to the places where water is invasive to expose on land. One of the tempting delicacies that the restaurants often serve for today’s visitors is the roasted fish with chili and salt. To make this dish, we have to choose fresh fishes, then the oil by washing warm water or salt water, remove the gills and intestines, and cut fins. Then add garlic, chili, seasoning powder and sweeteners before grilling on charcoal stove or electric stove. 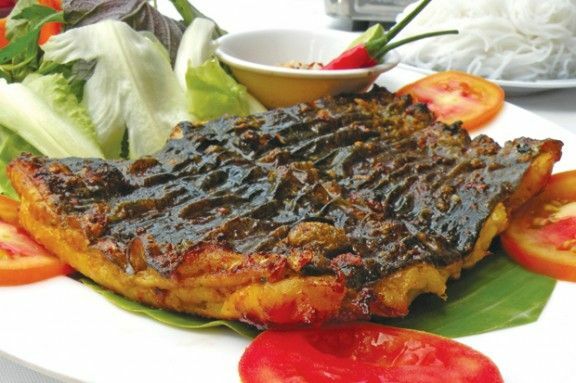 The sauce served with grilled fish is spicy or spicy chili. This dish can be eaten together with vermicelli or rice paper roll with vegetables, lettuce, cucumber, banana,… People like this dish because of its delicious specialty. After breakfast with Mam noodle at Chau Doc market, we roamed around for coffee. After sending the message to my friends, I stood outside the street, worrying that my friends would be lost. Across the street, there was a grilled charcoal stove, topped with round baked cakes. In the early morning, I saw many people stopping by and buying some cakes. It was known Grilled Banana wrapped in Sticky Rice with the price of 5,000 VND / piece. When driving to find coffee shops, I have seen lots of these lightweight grills along the street. Apparently, this is a popular breakfast in the western town in the bank of Hau river. Maybe because it’s handy, delicious, and cheap. Every stall needs only a charcoal grill of 40 × 100 cm, the pies were stacked together on the grill. The sticky rice wrapped in banana leaves radiates the aroma, stimulating the hungry stomach in the morning. The woman quickly turned the cake on the grill, and just explained to us how to make this food. 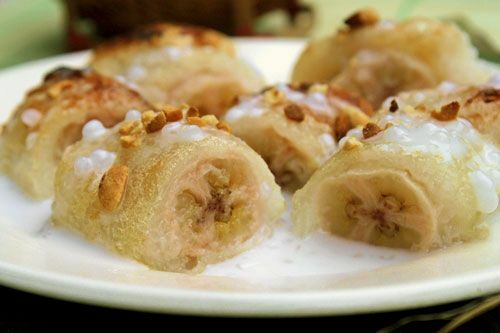 It looked simple but it’s actually quite difficult to make this kind of delicious Grilled Banana wrapped in Sticky Rice. Bananas were peeled, wrapped in a layer of sticky rice cooked with coconut milk, wrapped in banana leaves, then baked on the stove until the surface folds, just enough crunchy. Normally, the green banana leaves are dry, turning brown. Peeling hot and fragrant banana leaves, I bited a piece of grilled banana. The sweetness of the banana, the delicious taste of sticky rice in the smell of coconut made me excited. Such a cheap but delicious food! I bought a bag to bring to coffee shop. The grilled banana would be more delicious if we cut the grilled banana, added coconut milk and a little peanut butter before eating. But maybe just like the idyllic Chau Doc people stopped by to buy some grilled banana for breakfast, we each preferred to uncovered banana leaves and enjoyed all. One piece of grilled banana is enough for breakfast. Perhaps it is the aromatic and fatty banana that stimulates a sense of smell and taste quickly and made people felt full. I wrapped up two bags in the backpack to eat when I was hungry.